Island views, beautiful sunsets, and lush tropical landscapes! 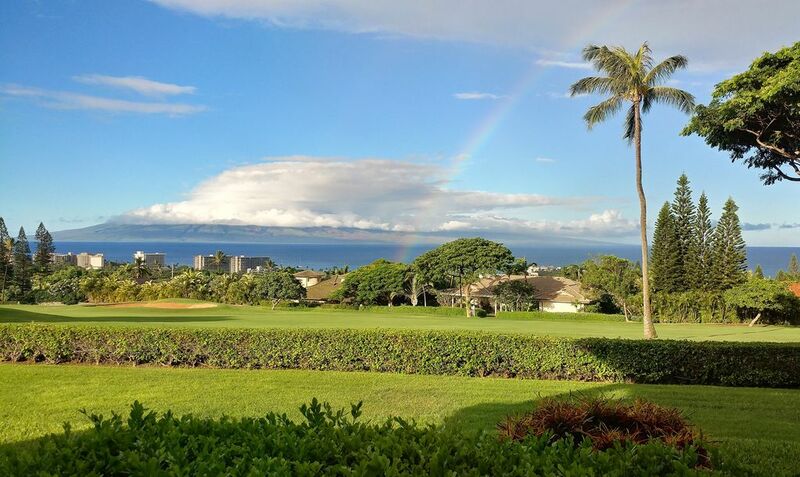 Situated high on the hills of West Maui, yet less than a mile from the beach, this unit offers expansive view of the ocean and the island of Lanai. The views from the master bedroom and lanai is priceless! Outside this ground floor unit, you are surrounded by lush, tropical garden setting and feeling of serenity throughout. There are 2 pools and 2 tennis courts. This unit underwent extensive renovation that was completed in February 2016. All furnishings are brand new with brand new central air conditioning that is more efficient and economical. We are from San Diego, California. Maui has been our "go to" place when we need a break from our busy life schedule. We hope to retire in Maui in the near future and so we wanted a place that could offer a view to admire every day. We found everything we were looking for at the Masters. From the amazing sunsets, ocean and island views, there is nothing comparable. The peaceful, relaxed setting and well-maintained tropical garden surroundings plus security, all add to it's luxurious living ambiance. The views from this condo are unparalleled. We watched the whales from the lanai every day! The condo is very well appointed and very comfortable. There are very clear instructions for how to access all of the appliances, TV, wifi, etc. The owner has thought of everything to make your stay a fantastic experience and is very responsive to inquiries. We highly recommend staying here. This condo is one of the nicest condo's we've ever stayed at. The location is perfect with sweeping views of the ocean and neighboring islands. It's close to beaches, restaurants and shopping but yet quiet at night.The unit is beautifully furnished, kitchen is fully equipped and it included snorkel gear boogie boards and other beach gear. There really isn't anything missing. The property and grounds are fabulous. Great views from this unit as well. If I knew of anyone staying on Maui for a month or more, this would be where I recommend to stay. We have seen a number of units at The Masters and this place is great! One of the few renovated units in the complex, fantastic views and our property manager, Patrick, was the best. He was super helpful anytime something came up and very responsive. Loved him! We felt so at home here, it was hard to leave. My only catch with this place are The Rules and "Don'ts" that are plastered all over the complex... i.e. No Cell Phones in the Pool Area. It is also what makes for a quiet and relaxing experience. We have 2 small children (2 and under) so we felt like we were always the ones creating the most noise in the entire complex. Because they are so little, the safe area in the pool, is quite small. We didn't find a great play area within walking distance but made due with the grassy area just outside the unit. There are other properties that are more accommodating to children but I would easily stay here again despite that. The grounds and facilities are very well maintained, using quieter methods as much as possible. Controlled access to the property which is in a good location. The specific condo we stayed in is being updated very well, and has an excellent view. Our stay was comfortable and we will return next year. A very comfortable condo and we loved everything about it!! Can't wait to return next year!!! Beautiful Home with everything you need for Maui Fun! This unit in Masters is like new - and in a great location with idyllic views of Kaanapali, the ocean and Lanai. Easy walk to the Fairway Shops for dinner out, or to the hot tub, pool and tennis courts in the Masters. Thanks for sharing with us! !